ZnS and Cu2+ (0.50 and 1.00 %) doped ZnS (i.e., ZnS:Cu) nanoparticles (NPs) are synthesized by chemical co-precipitation method at room temperature. X-ray diffraction (XRD) studies and the analysis of the selected area electron diffraction pattern (SAED) obtained from transmission electron microscopy (TEM) confirmed the formation of zinc blende structure of all the synthesized samples. Irrespective of the samples, the average particle sizes, as obtained from the XRD and TEM is about 2.5 nm. The room temperature photoluminescence (PL) emission measurements revealed the presence of green emission band in all the ZnS:Cu samples which is attributed to Cu2+ incorporation in ZnS. It is found by Gaussian deconvolution of the measured PL spectra of the synthesized samples that two peaks appeared at 405 and 445 nm in undoped ZnS NPs. In addition to the above two peaks, a third peak is noted in green region for ZnS:Cu NPs, the second and third peak shows a red shift with increasing Cu2+ concentration. Three photon absorption (3PA) and nonlinear refraction (NLR) coefficients are also measured at 532 nm, the second harmonic of a Q-switched Nd:YAG laser radiation, by using the z-scan technique, viz., in 0.5 % Cu2+ doped ZnS:Cu sample. From the analysis of open aperture (OA) z-scan data it is found that three photon absorptions (3PA) is the dominant mechanism for appearance of nonlinear absorption (NLA) in the sample and the extracted value of the intrinsic 3PA coefficient is ~109 times larger than that of bulk ZnS. 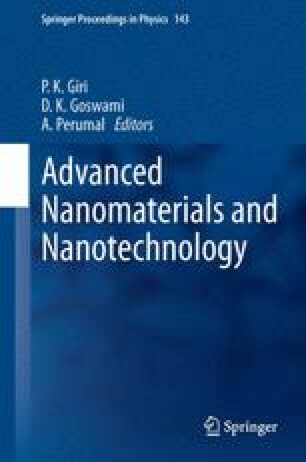 Authors are grateful to Department of Science and Technology (SR/FTP/PS-67/2008), Government of India, for the financial support. They express their sincere thanks to Dr. U. Chatterjee of Physics Dept, Burdwan University and Dr. R. Sarkar, NIT Durgapur for their technical help during experiments. AKK is grateful to the Ministry of Human Resource Development (MHRD), National Institute of Technology Durgapur, India for the maintenance scholarship.